I received a meal to facilitate this review. All opinions are my own. I love eating out. Trying new foods and taking in the sights, smells, and sounds are totally exciting to me. 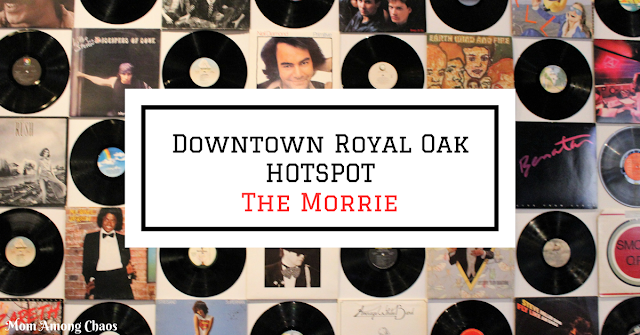 I could not wait to check out the downtown Royal Oak hotspot The Morrie. Royal Oak is full of trendy restaurants, so I wanted to find out why The Morrie was the newest hotspot in Royal Oak. The first thing I noticed was The Morrie was all about the music. I worked at Blockbuster Music for five years while I was attending college and those were some memorable days for me. So, music always takes me away to a special place where I can relive memories for a little bit. I joined a bunch of local bloggers for our feast at The Morrie. The waitress recommended trying The Train in Vain B-Side. I went back and forth because she also had recommended a coconut drink, but I was not really in the mood for a warm drink. This cocktail reminded me of a pear martini. If you're a pear fan, this is perfect for you. Are you drooling yet? The next round was appetizers. I'm going to be completely honest that I was busy chit-chatting and studying the fresh decor that I missed trying the one big ole' meatball. Either that or the girls had devoured it before I had a chance. I guess that means I need to go back. Right? I did manage to nab some kung pao cauliflower and let me tell you it was fantastic. I'm not a cauliflower fan, but I promise you I could have devoured the whole appetizer. So good!!!! While we were enjoying our food, a live band started to perform. If you enjoy music check out The Morrie live music schedule. They even have a house band! Finally, the main course. I learned that The Morrie makes its own bread. I love fresh bread, so this really impressed me! I selected the B.E.A.L.T with sweet potato tots for my dinner. I love BLT's and pork so I thought I would give this combination a try. The sandwich is made of pork belly, bacon, fried egg, arugula, tomato, avocado, basil mayo and sourdough bread. Honestly, the sandwich was great, but for some reason, I didn't feel like the egg worked flavor wise. I thought it was a little overpowering on the sandwich. The sweet potato tots were outstanding and cooked perfectly. I had a minor family emergency and had to leave before my favorite course, dessert. I did enjoy checking out all of the delectable treats on Instagram. This girl was jealous! Would I recommend The Morrie? Why yes! I would love to visit again and take my husband. Also, I need to go back for dessert! The Morrie, located at 511 Main St., Royal Oak, Michigan. You can visit http://themorrie.com/ to learn more!